Book Ferries to Italy, Greece, & Crete with Anek Superfast - Ancona, Igoumenitsa, Patras, Piraeus & More! 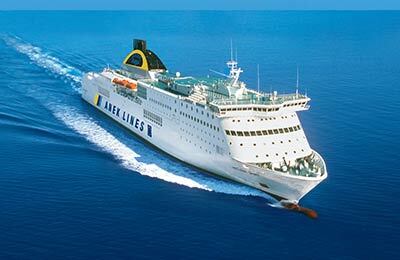 You can use AFerry to book an Anek Superfast ferry to mainland Greece, Crete and Italy. Anek Superfast is a joint venture between Anek Lines and Superfast Ferries. The joint service was put in place to optimise capacity for the demand on the Ancona-Igoumenitsa-Patras route. AFerry always has cheap prices for Anek Lines ferries and the latest special offers. 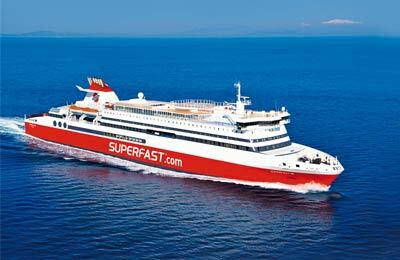 You can use AFerry to book Anek Superfast ferries to Heraklion, Piraeus, Igoumenitsa, Patras, and Ancona. See below for all Anek Superfast routes and the latest prices and sailing times. Click on your ferry route for a detailed Anek Superfast timetable. Anek Lines and Superfast Ferries have combined to form a larger fleet. On board an Anek Superfast ferry you will find a full range of facilities. In addition to a choice of comfortable cabins and seats you will find a la carte and self service restuarants and bars. In the summer months you might also consider taking a dip in the on-deck swimming pool to really start your holiday with a splash. You can now book the 'Camping On Board' service with AFerry. Camping on board offers customers a great value for money service which is available on all Anek Lines routes except Venice - Patras. The camping on board service is only valid for passengers travelling with a motor home or caravan. For the price of a simple a deck ticket per person plus the price for the vehicle, you can sleep in your motor home or caravan and have free access to 220V electricity and the use of the shower and toilet facilities. Whether you use the Anek Superfast Piraeus Heraklion ferry route, the Anek Superfast Igoumenitsa Ancona ferry service, the Anek Superfast Patras Ancona ferry or any other ferry from Anek Superfast, you are bound to have a relaxing and enjoyable journey. So what are you waiting for? The loadmaster was very helpful as we have a big motorhome and we tow a car so knowing exactly where he wanted us to end up was great. Air seats are ok but would recommend taking a cushion on board. The food and drinks were very expensive. I will book only with Abel Lines because they are the best.